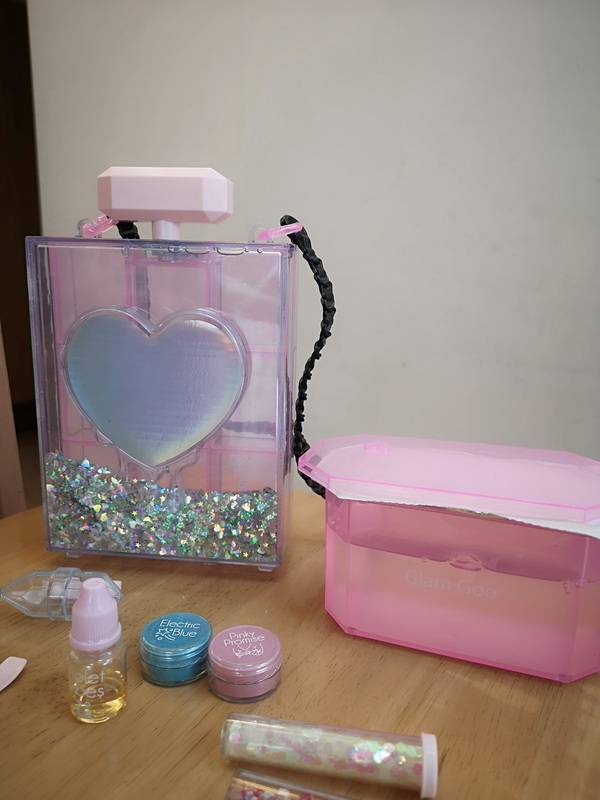 The Glam Gloo Deluxe Set has a tub of clear slime (goo), 3 vials of glitter called Unicorn Tears, Daydreams and Cloud Crunch, 2 pots of colour (1 Pinky Promise and 1 Electric Blue) and a small bottle of fragrance. 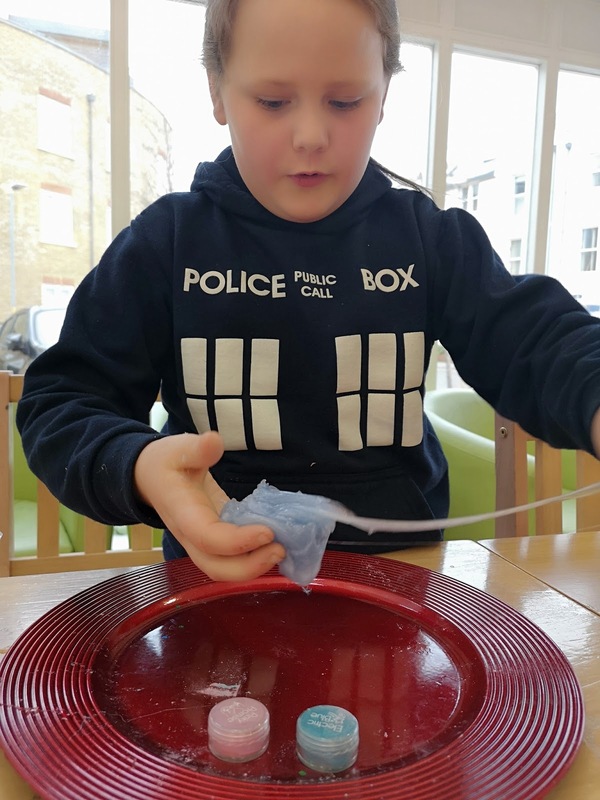 There is enough of the goo to make 9 different lots of slime to fill the storage tub up. 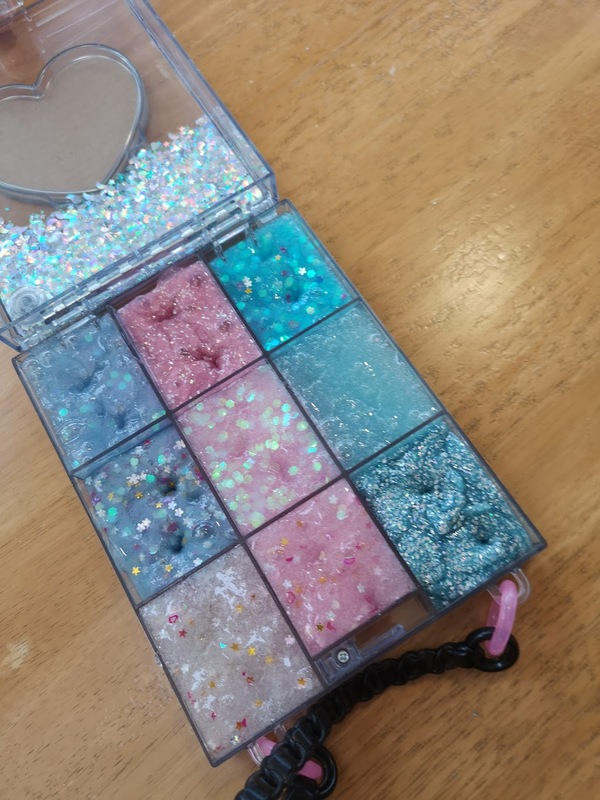 The set also includes a ring with a huge diamond on it and you open the diamond and add some goo to add sparkle and colour to it. 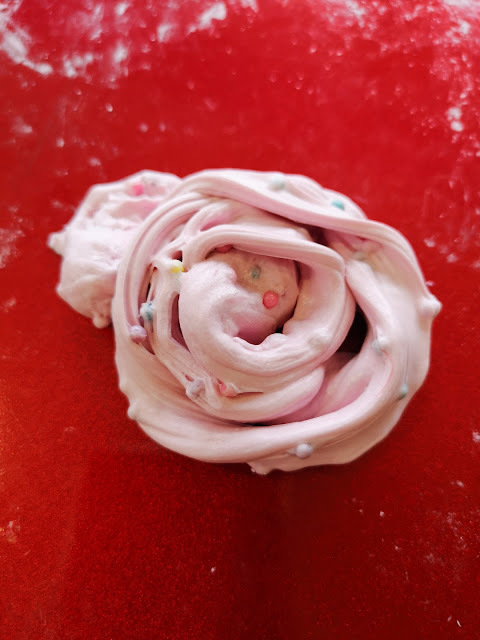 The goo is ready-made, and it is just a clear kind of slime and it is ready for you to design as your own. 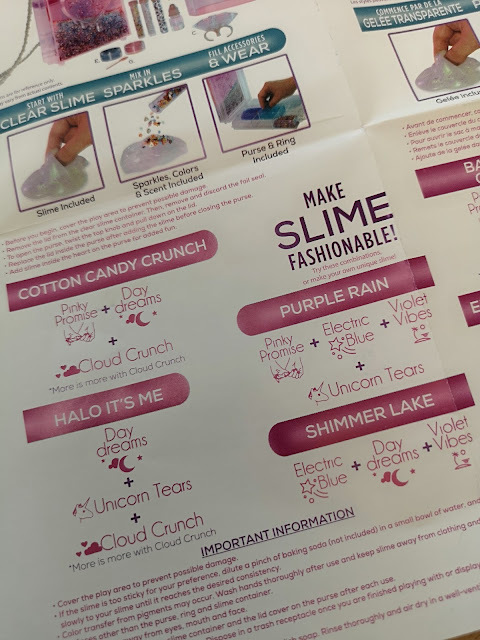 You simply follow some of the recipes on the instruction paper to make some glam goo or you can make up your own design of Glam Goo. 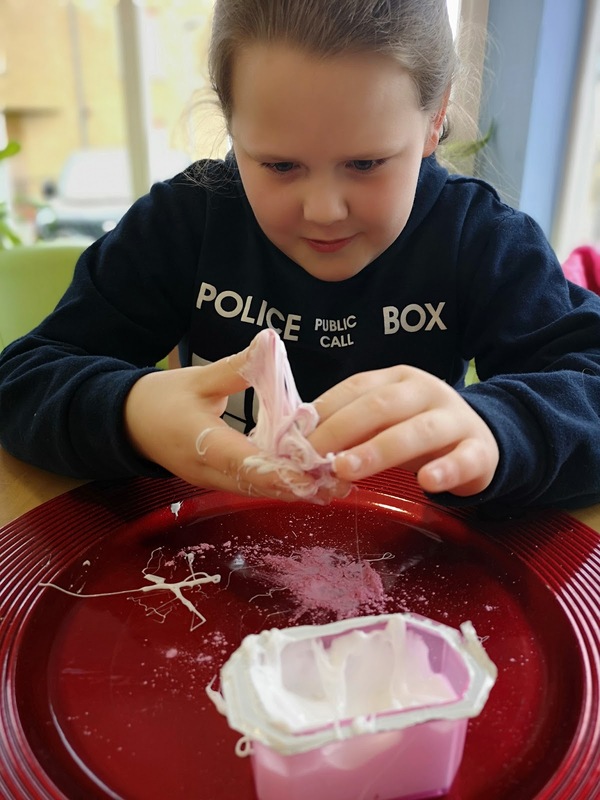 Although it comes with some glitter and colour, you can add your own ingredients to make your own design of goo. 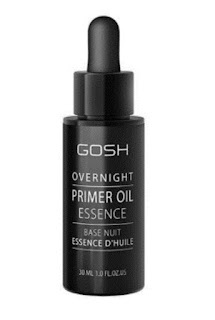 Although Matilda really liked this product, as a parent I wasn't a big fan of it. The goo was very runny and sticky and it took a lot of working to make it mouldable and playable. 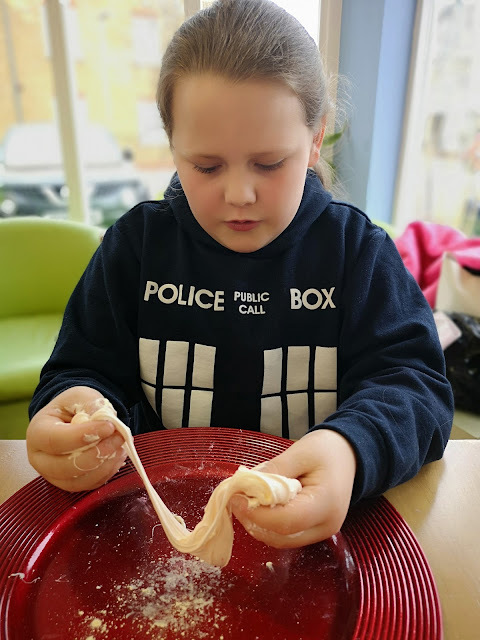 It was very messy to use and really sticky to touch. I'm not sure if I would buy this product for her in the future, but if she got it as a gift, I would be quite happy for her to use it. 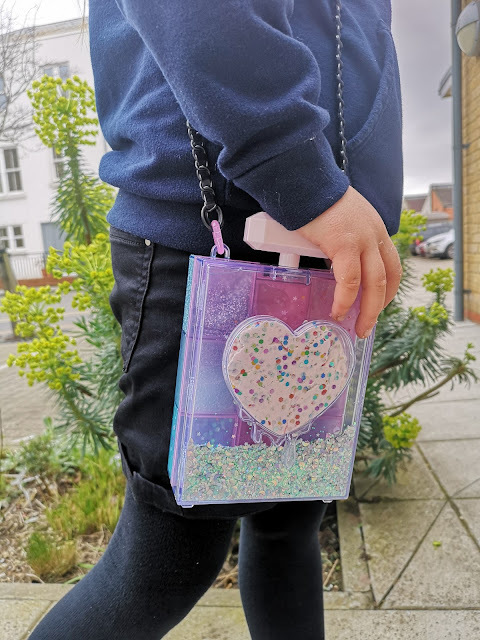 The box-shaped bag is a storage tub and it has 9 compartments to put the Glam Goo in once you have made it and the front is decorated with a heart shape, that you can open and put more Glam Goo in it to add some colour. 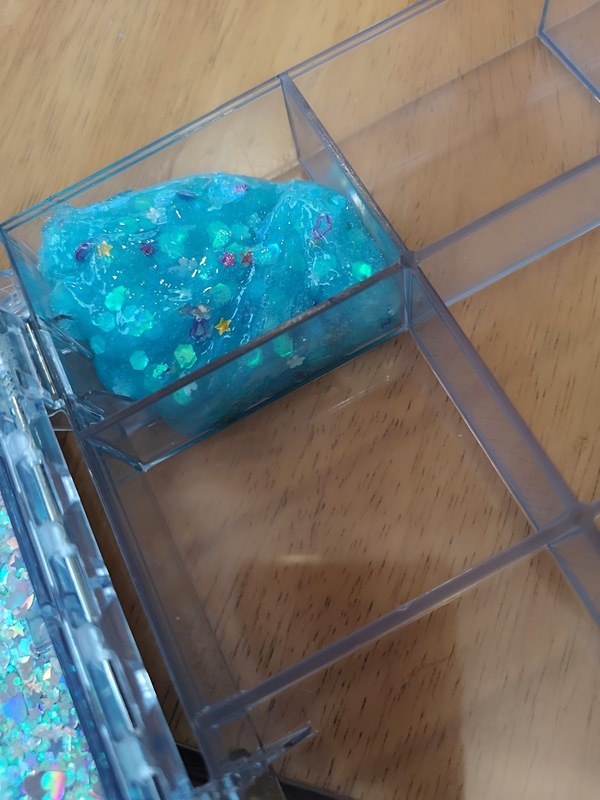 The front of the box is also filled with water and glitter, so it has a decorative look to it. 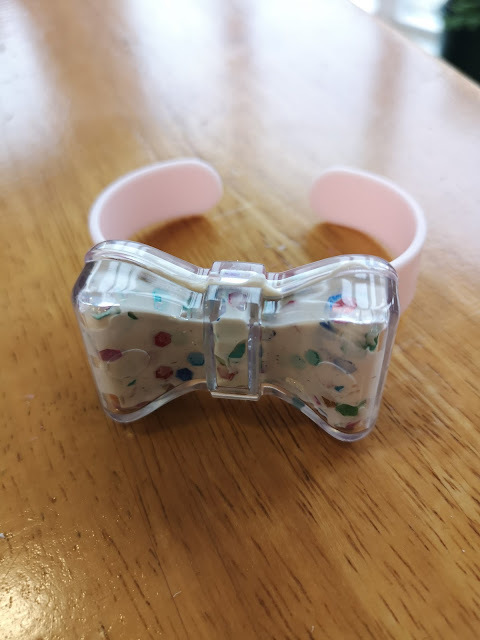 The second set was a smaller set was a Glam Goo Confetti Set that contained a bow-shaped bangle and a clear bear shaped keyring decoration. The dance mix and rainbow party confetti glitter and two colours of 'Have Fun' and 'Happy' as well as a peach fragrance. 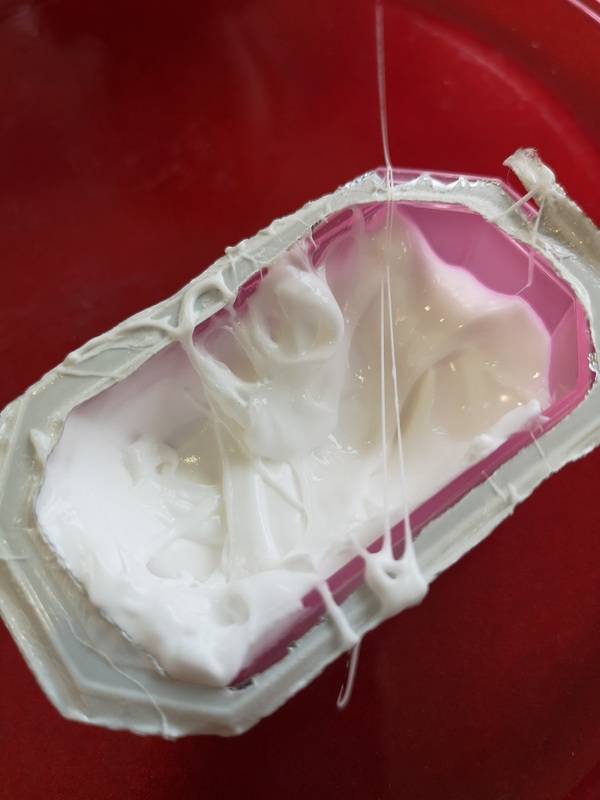 The goo in this pack is white and more of a cloud slime. The goo in this pack is white and thicker, it is a cloud slime, and it seemed to be easier to work with than the other goo, but it was still sticky. The goo looked better once it was worked and it was more pliable. It comes with a recipe sheet again of designs that you can make the goo or you can use your own ingredients to make the goo. 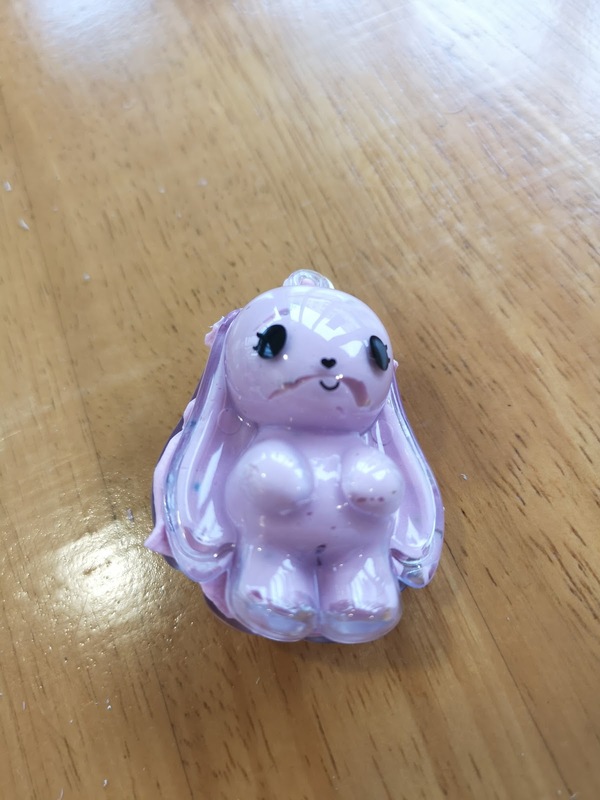 The accessories come apart for you to pop some of the Glam Goo in them. 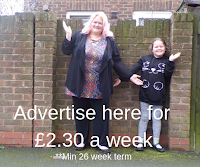 But once they had goo in them, we found they never closed properly, so it would be ideal if there was a catch or something added to the design, in order for the parts to stay together. There was no key chain to go with the charm, despite there being a picture of one on the front of the box, but you can use the bear charm on a necklace quite easily. The bangle was cute, but quite small so it would be better for a younger child. It is nice to let the kids design their own jewellery to wear. There was a bit of the Goo left, so we popped it back in the pot that it came in. 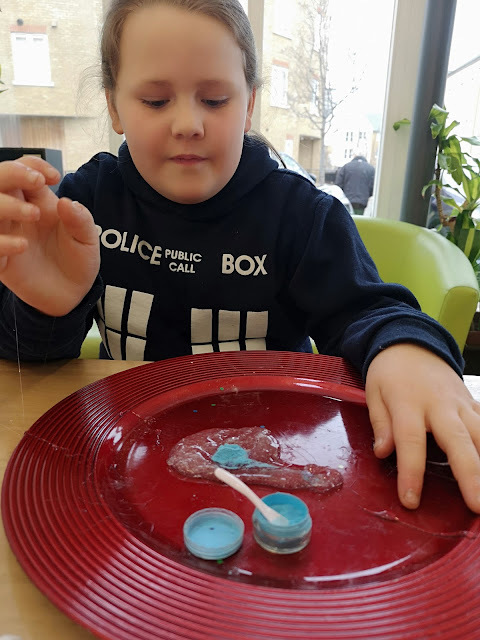 It was great that Matilda can design her own slime and now I don't have to pay £3 or £4 for a small pot of glitter slime from places like Paperchase, where she insists on buying it from. 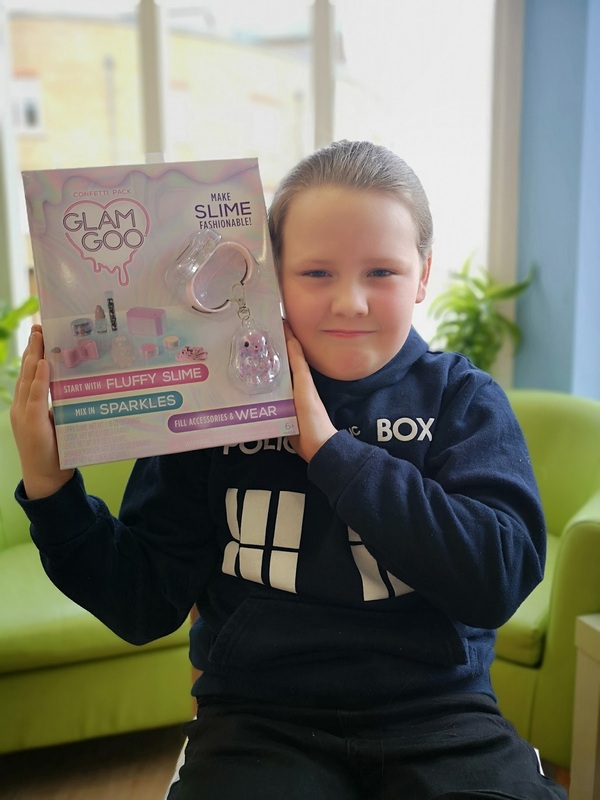 The Glam Goo Confetti Slime set is available from all good toy shops like Smyths for £9.99. 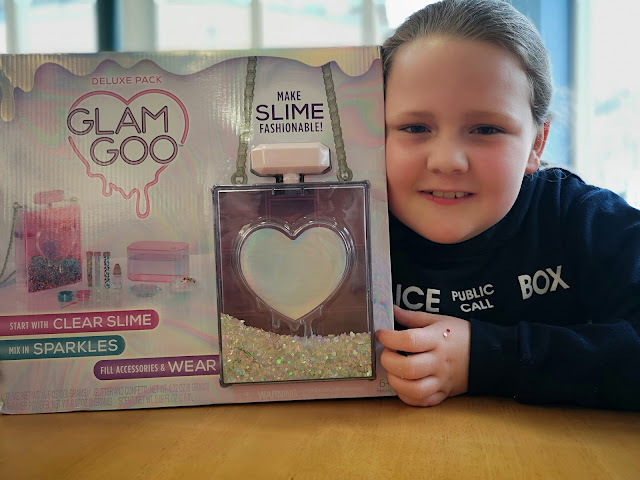 The Glam Goo Deluxe Set is also available from Smyths for £18.49.